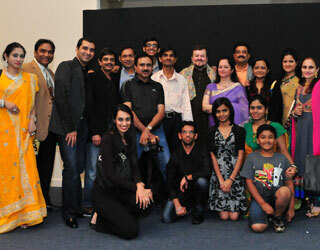 A memorable performance by Nitin Mukesh and his orchestra was enjoyed at Atlanta Event Hall on Friday, May 24, 2013. The theme of the near five-hour performance was “Remembering Mukesh,” the legendary Bollywood playback singer of yesteryears. 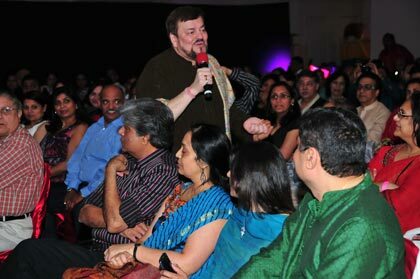 Mukesh's son Nitin Mukesh, a very accomplished singer in his own right, presented the immortal melodies of Mukesh. Nitin captured the heart and imagination of all who attended. Accompanying Nitin Mukesh were female singers Namrata Sheth (Nitin’s younger sister) and Manasi Paranjape (a playback singer). They wooed the audience with hits of Geeta Dutt and other nostalgic numbers, especially “Phool Tumhe Bheja Hai Khat Main” from Saraswatichandra. All were accompanied by the finest seven-member Bollywood orchestra who also put up a tremendous performance for Atlanta music lovers. “Remembering Mukesh” brought back memories—from Sangam, Awaara, Chhalia, Shree 420, Kabhi Kabhi, Milan, to Roti Kapada aur Makan. Mukesh's legacy includes numerous melodies that are simply immortal. Having been intimately involved in the life of Mukesh, who better to bring his music and moods back to you than his own son Nitin. Nitin started with a shloka and then commenced a fantastic performance. Mukesh’s incredible association with India’s great showman Raj Kapoor was brought to life through renditions of ageless hits like “Jeena yahan, Jaane kahaan gaye woh din” (Mera Naam Joker) and the duet “O mere sanam” and “Dost dost na raha” from Sangam. He sang nostalgic songs in the beginning, later changing to fast pace with thumka songs that put the audience in a dancing mood. Nitin was very personable with his singing and mingled well with the audience. His magnetism was clearly visible to the excited audience who started dancing to many of his numbers. “I'm really happy, it's a different kind of experience, which I will remember throughout my life," Nitin adds. Nitin has toured internationally, including his previous trip to the United States in 1993 and a world tour in 2006 with his show Kal Ki Yaadein, a tribute to his father. Nitin's son Neil Nitin Mukesh is a well-known actor now. Nitin chose to distance himself from playback singing and the 65-year-old singer is today content with live shows around the world and music albums. The show was sold out, despite the Memorial Day weekend when many people were away. Organizers Ramzan Virani, Ashok Goyal, and Dil Entertainment had the help of Arvind Goel and Ramona’s Party décor for decorations, Sandeep Savla for sound, Sunny Molu for lighting, Pravin Patel of PhotoExcellence for photography, and Shehnai Art Studio for video.